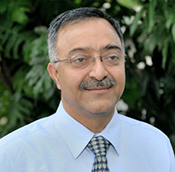 Dr R.K. Kohli, an ecologist with highest global accreditation and JC Bose Fellow (highest Research Fellowship of India) is Vice-chancellor DAV University, Jalandhar. He is Fellow of all the four official national academies (FNA, FASc, FNASc, FNAAS), a rare distinction. He had been a member of the Senate and Syndicate of Punjab University. Former Chairman of Department of Botany, he led departments of Vocational Agriculture, Environment Science and Solid Waste Management and brought the University at top in the field. His research focuses on inter-plant interaction and Invasion of Alien plants in India. Since 2005, he continues to lead IUFRO’s international research working group on Ecology of Alien Invasives. Apart from two patents to his credit, he has published over 225 research papers, authored two and edited nine books, of which five published from USA & one from UK. Apart from the Punjab Ratna Award, he had been a recipient of Haryana Vigyan Ratan Award of the Govt. of Haryana, B.P.Pal Environment Fellow Award – the highest Fellowship award of Ministry of Environment and Forests. Chandigarh Administration honoured him for his services in the field of science. He held SAARC Chair in Bangladesh and had been an Adjunct Professor of the Chinese Academy of Sciences. Dr Kohli is a part of International Jury for the Albert Einstein Award for the Outstanding Scientist, World Cultural Council Mexico since 1999.